It’s been seven years ago since the last ‘new’ album was released by this German band. They did release a compilation and a DVD in that period however. I’d almost forgotten about the existence of this band, but I was greatly pleased by this new effort. 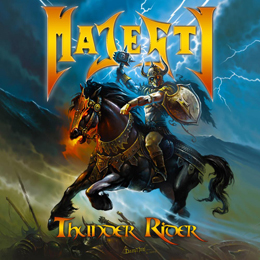 It’s not innovative, but somehow it manages to mix epic power metal à la Manowar with classic heavy metal à la Judas Priest. Now both of the aforementioned bands have always been high on my list of preferred bands, so imagine what a combination of both styles could do. As could be expected, the song titles are reflecting what kind of music you’re dealing with, but who gives a damn about such a detail, when the music sounds that good. It may recapture all clichés of the genre, but I don’t care. Even if some people might find this sounds cheesy, so what.